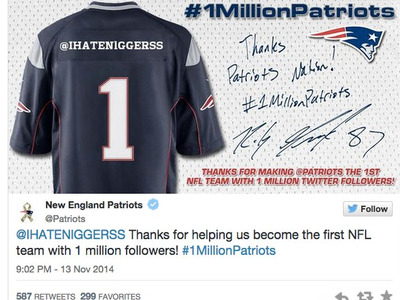 Football’s New England Patriots just reached 1 million followers on Twitter. The bad news is that what they did right after is going viral for all the wrong reasons. After reaching the mark they posted this tweet, according to Deadspin. The Patriots have deleted the tweet since, this timely screenshot comes courtesy of Deadspin who was quick enough to snap it. Here’s what happened – the Patriots said they would create custom avatar jerseys for anybody who retweets this tweet (now corrected), according to Deadspin. This was an early and unfortunate result. We apologise for the regrettable tweet that went out from our account. Our filtering system failed & we will be more vigilant in the future.